In case you missed my guest post over at Between U & Me the other day... here it is! Ok, I'm not gonna lie... I'm really proud of this cake. Like, SUPER proud of this cake. So much so, that I would like to share with you how I did it. 2. Put on a crumb coat using whatever icing you want. I used canned because I didn't feel like making half a dozen batches of icing. This was buttercream. 3. I baked a white 8"x8" cake (plus a dozen cupcakes) because I figured that not everyone would really like strawberry cake. Once cooled, I cut 1/3 off, then cut that 1/3 in half. 4. 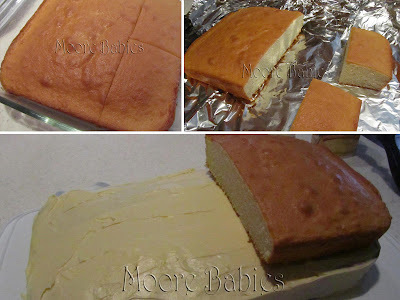 Put the 3rd layer on (secured with skewers... we should have leveled the cake, but we didn't) and crumb coat and chill. 5. NOW using my Grandma's Wedding Icing recipe, cover the whole cake in green. 8. Next came the grass using tip 33. And then I took a break because my hand got sore. Back to the fridge went the cake. 9. Finally, I added in some color with some flowers; I made drop flowers (yellow) with tip 18 I believe and I made rosettes with tip 16. Now we are ready for PARTY DAY! but with 17 3 year olds hovering around begging for cake, I had to give in. beautiful! My daughter would loooooove it! Well, you should be proud, that is freakin' awesome! And you're making me hungry, my stomach started growling just looking at this, lol! Amazing cake Stevie!! Sounds like it was a big hit! This is such a fun cake. Thanks for sharing. So adorable! I sure hope my daughter likes Strawberry Shortcake when she gets older! Wow, you did an awesome job! I wouldn't want to cut into it either, but I'm sure that it tasted just as good as it looked. Very nicely done. Thanks for sharing so many tips for this process. Cute cake!! The birthday girl was so lucky. I wish I had cakes like that when I was a kid. Just pinned this! Really amazing! You should be proud-it's gorgeous! This is adorable! :) I'm a new follower and would love to have you stop by my new blog and follow, too. My first link party/give-away is running now through Saturday night. I'd love to have you share this! Awesome!!! If I made that cake, I would be proud too :) Thanks so much for sharing this with us at Sharing Saturday. That's awesome! You should definitely be proud! Layering cakes is not the easiest thing at all and you did a great job! Thanks for linking up to my party! Completely adorable! I just pinned it to remember for my daughter's birthday!! I'm glad I came across your blog, which I just love. I myself dabble into cooking,decorating,baking,photgraphy,and crafting. Look forwards chatting and sharing ideas with you. option? There are so many choices out there that I'm completely confused .. Any recommendations? Kudos! Where did you get the dolls from? Find me at 'Between Me & U' today!